Goliath was a nine-foot-tall soldier from Gath. He bragged that he could beat any Israelite soldier who would fight him. But all the Israelite soldiers were afraid to fight him. David was a young shepherd boy who believed in God. He said, "The Lord who delivered me from the paw of the lion and from the paw of the bear, will deliver me from the hand of this Philistine." David took his sling and five smooth stones from the brook. Then he went to fight Goliath. King Saul wanted to put his heavy armor and helmet on David. He also tried to give David a big sword, but David said he could not wear them. He knew that his strength and protection came from God. 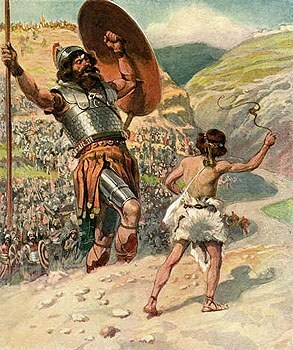 Goliath cursed the boy coming out to fight him. David said to the Philistine, "You come against me with sword and spear and javelin; but I come against you in the name of the Lord Almighty, the God of the armies of Israel, whom you have defied." David threw a stone with his sling at Goliath. It hit Goliath in the forehead and the giant fell face down. Without a sword in his hand he struck down the giant and killed him. David believed in God, and God helped him win over the giant. David trusted God to help him even though the giant was much larger than he was. Do you have any "giants" in your life? Is there something so big that you don't see a way to overcome it? Ask God for help in meeting this enemy. Go to your parent, teacher, or a trusted adult for their wise counsel. Don't try to solve the problem by yourself. This story about David and Goliath can be found in the Bible in First Samuel 17. English Bible Activities Select stories #78-79 in the list for activities to accompany this Bible story. Spanish Bible Activities Select stories #78-79 in the list for activities to accompany this Bible story. Press "Go" to search for books about David and Goliath. but just who’s side we’re on. we’ll not fall, but win them all. and watch over us with pride. when God is on our side. This page displayed 577,185 times.